An easy to use, rapid-setting water plug for stopping live water leaks within minutes. 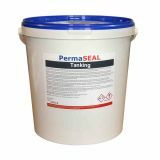 PermaSEAL Waterstop is a cement-based ready-to-use mix, designed to quickly stop live water leaks. Our water plug mortar sets rapidly allowing you to prevent any water leakage within three minutes. It is designed for use with concrete and masonry. The mix contains chemical modifiers and selected graded aggregates to ensure complete water plugging wherever it is applied. It dries without shrinking so that you have enough time to carry out a permanent repair. The product is easy to use; all you need to do is mix with water on site and apply. Once mixed with water, the Waterstop powder with its chemical modifiers starts to react. Within a few minutes, it sets hard to form a plug of mortar. This water plug will resist any water ingress for sufficient time for you to apply a permanent waterproof slurry over the top. 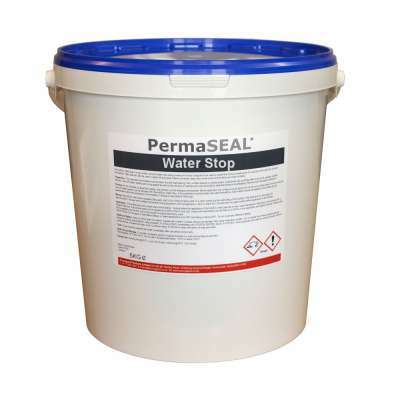 On its own PermaSEAL Waterstop sealant is only a temporary fix. It will need to be overcoated with a permanent tanking layer such as PermaSEAL Tanking. Start by removing any loose material from the surface. You want to ensure you have a sound, clean surface that provides a good mechanical key. For sealing cracks, horizontal and construction joints, you will need to cut these back to a minimum depth and width of 20mm. NOTE: When plugging in wet conditions, there is no need to prime the area. On dry concrete or masonry, you will want to wet it with clean water prior to applying the waterstop. Mix four parts Waterstop power to one part water. Once mixed, immediately press the Waterstop firmly into the crack or fillet using a fillet trowel. When working against water pressure, you should work towards the point of highest pressure. Finish using a gloved hand, forcing the material against the pressure until set. Cut off excess material from face within three minutes. Dampen fillet after application. NOTE: Alternatively the product can be applied as a powder in a gloved hand and forced into the void. When mixed with water, the water plug is alkaline. You therefore need to take steps to ensure it doesn’t come into contact with skin or eyes. During mixing and application, wear safety glasses, a dust mask and gloves. If skin contact occurs wash thoroughly with clean water. If you need any additional informational on using rapid waterstop products or carrying out water plug concrete repairs then get in touch. Our experts are available on 0117 982 3282 to discuss your basement waterproofing and tanking needs. Tested in accordance with EN 12390. Mix four parts Waterstop power to one part water. Use immediately.